PART 1: Despite — or perhaps because of — Colorado mountain dwellers’ love of hiking, skiing, bicycling and all things physical, health care costs are stubbornly stuck far above average. 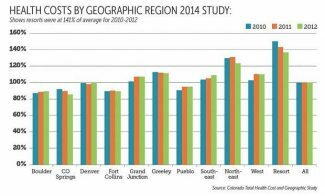 PART 2: How did western Colorado reach a point where for some people, health-care costs more than a large mortgage? PART 3: People in the mountains use MRIs and other imaging services, as well as pathology and lab work, at three times the rate of the rest of Colorado, part of why costs are higher. PART 4: Health experts in the mountain resorts and metro Denver warn critics to be careful what they wish for — tossing out all or part of the Affordable Care Act can make things a lot worse. 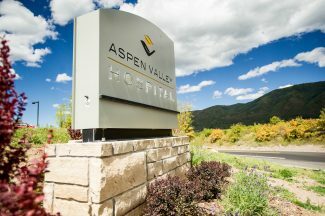 PART 5: Facing much higher costs, many high-country residents wonder whether their hospital bills are justified — or whether the amenities have to be so nice. PART 6: Innovation, generosity and cooperation are showing some promise for tamping down high-county health-care costs. Editor’s note: This story is the third in a six-part series on health care costs in the Colorado mountains. People in the mountain resort towns of Colorado are used to spending as much as 15 percent more for gasoline, groceries and housing. But why 50 percent or 80 percent more for health care? There are reasons why that didn’t happen, some that make grudging sense to high country residents and some that don’t. Under the Affordable Care Act, no longer could insurers charge more to those with pre-existing conditions, and limits were placed on how much extra they could charge older people or women of child-bearing age. They could charge more to people who admitted to being smokers, but couldn’t charge more to people who were couch potatoes or made bad judgments or went to the emergency room for all their care. And they couldn’t exclude a long list of services that are required under the tenets of Obamacare. 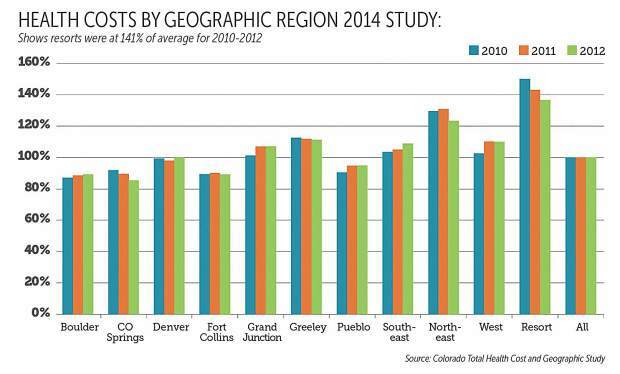 Outpatient care per person per year was $2,022 in Zone 9, but $1,075 in Colorado overall in 2014. People here were using MRIs and other imaging services as well as pathology and lab work at three times the rate of the rest of Colorado. • Advanced imaging (MRIs, CT scans, etc.) cost $185 per person per year in Zone 9 versus $47 statewide. • Physical and occupational therapy was $49 per person per year in the mountains versus $19 statewide. • Outpatient surgery was $852 here versus $409 statewide (see chart on page A12). It’s a combination of higher costs and more use of services, Salazar said. Yes, many people are in good shape in the mountain resorts, what with their snowboarding and hiking, rock climbing and bicycling, she said. But with those pursuits come the danger of fractures, tears, lacerations and separations of body parts. Pitkin, Summit, Routt and Eagle counties have only one hospital each, and the choice of insurers is thin with Humana and United Healthcare leaving the individual market last year. “When a hospital has that kind of monopoly, it can make it difficult” for an insurance company to offer affordable rates, said Colorado Lt. Gov. Donna Lynne. Insurers that want to compete in a geographic area of the state must by law establish contracts with providers and hospitals that are reasonably close to clients’ homes. “In that respect, sole community hospitals have a lot of leverage over the health plans,” Lynne said. And so the prices are high, the usage is high and therefore what people in the mountains and valleys pay in monthly health care premiums also is very high. But not all the data agree. The state’s Single Geographic Area study found that outpatient care in Zone 9 was indeed double the statewide average, but that the overall health care cost here was about $6,300 in 2015, compared with $5,100 in Denver and $5,200 statewide. The overall health care cost is only about 21 percent higher here than statewide, but that includes everyone, from Medicaid and Medicare customers to the more than 50 percent who get their coverage from their employers to the self-employed purchasing their own plans. It is in the individual market that premium prices are double here. And for better or worse, insurance companies showed that the costs of covering that group justified the big jumps in premiums, according to the Colorado Division of Insurance. 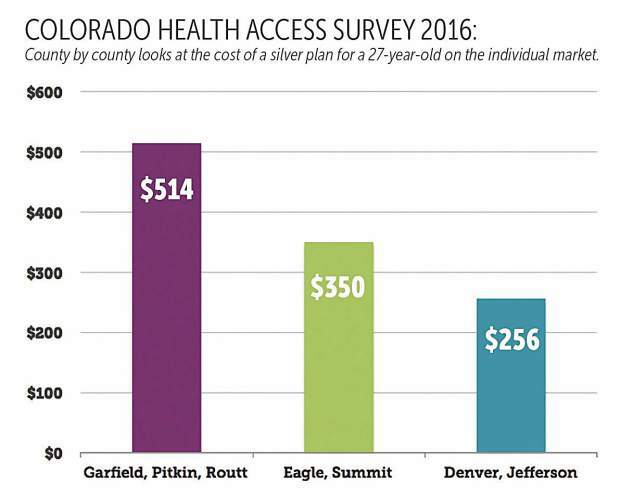 “It still doesn’t explain to me why our premiums are so much higher,” said Colorado State Rep. Diane Mitsch Bush, whose district encompasses Eagle and Routt counties. “My constituents are in an emergency. They can’t afford health insurance,” and if they don’t renew because of the high cost, not only is that going to hurt them, it’s going to hurt everyone, she said. 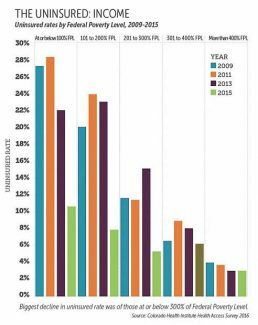 When healthy people leave the system, those left in the risk pool incur higher per capita costs, and premiums shoot up again. 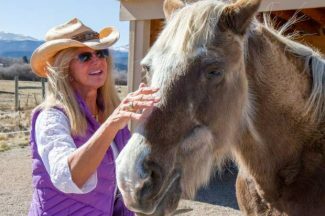 Jill Ryan, Eagle County commissioner, recalls the high hopes when a coalition of county commissioners, state lawmakers and other stakeholders first tried to get the state to look at changing the geographic zones. “They described their rates as paying a second mortgage — $1,200 to $1,900, and that’s with a high deductible,” Ryan said. They both couldn’t afford to go without health insurance and couldn’t afford to pay for it. Several said they were on the verge of giving up on their dream of being independent businesspeople — that they would have to get a “real job” where the employer foots most of the insurance costs, or move to Denver or somewhere where the premiums are about half the cost. Equalizing cost for all rewards the person who doesn’t take care of himself, the hospital that doesn’t cut costs to the bone and the provider who is too quick to order up a test, said Bill Lindsay, who chaired the Colorado Commission on Affordable Health Care that delivered a report to Gov. John Hickenlooper and state lawmakers last year. If that is true, then in a couple of years, the mountain region’s costs should creep closer to the state average. But no one knows for sure yet. Mitsch Bush wishes the Division of Insurance had given more thought to rezoning, particularly one proposal to make six metro zones and two western zones — one in the east, one in the west. That would have given a reduction to people in five of the regions and a relatively modest rise in the single digits to people in Boulder, Denver and Colorado Springs, she said. Another proposal by lawmakers was to force insurers to offer plans in all counties if they offered them anywhere at all. But the Division of Insurance can’t force insurers to do that, Salazar said. Last year, when United Health Care and Humana dropped out of the individual plan market, it left 20,000 Coloradans scrambling for an alternative. “That’s their prerogative. We can’t get into their business,” Salazar said. Lynne agreed, noting that in America, health insurance is a business. “At the end of the day, health plans want to take business away from other health plans and hospitals want to take business away from other hospitals,” she said. “The big problem is that health care is too expensive,” Salazar said. What is driving the cost and what can we do about it? Of the two companies that left Colorado’s Individual Market this year, Humana reported a 5 percent margin in 2014 and United Healthcare a minus 18.9 percent. But those skinny margins reflect the net after not just essential administrative costs, but such things as bonuses and handsome compensation packages for company executives. Those will be especially huge if the big companies merge with one another. Anthem wants to buy Cigna and Humana wants to merge with Aetna, but so far courts are blocking the attempts on grounds that it will be bad for consumers, leaving them little choice and driving up prices. By comparision, Vail Valley CEO Doris Kirchner was paid $762,543 in 2014, Valley View CEO Gary Brewer was paid $913,700 and Yampa Valley CEO Frank May was paid $358,577. The western Colorado coalition isn’t giving up on its efforts to bring all stakeholders together for an honest conversation about prices and geographic zones, Ryan said. But it’s a conundrum.